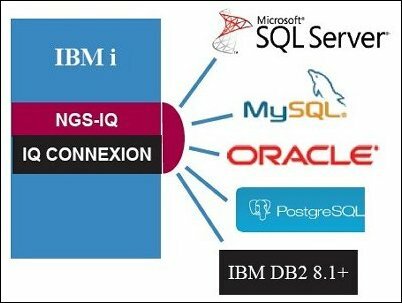 IQ Connexion™ extends the reach of the NGS-IQ business intelligence and enterprise reporting solution from DB2 on IBM i (iSeries, AS/400) to Microsoft® SQL Server, MySQL, Oracle®, IBM DB2® on other platforms, and PostgreSQL databases. This module enables you to use NGS-IQ to develop queries, reports, spreadsheets, OLAP models, Web reports, and other forms of output from data in all of these popular databases. IQ Connexion extracts remote data and transforms it into DB2 on IBM i so that you can work with it in NGS-IQ just as you would any other DB2 file. If there are common fields between the original DB2 files on IBM i and the files created by IQ Connexion, NGS-IQ lets you join them to create valuable reports that bring together important and previously isolated data elements. This multlple database access feature makes NGS-IQ and IQ Connexion particularly valuable to IBM i customers who run a mix of business application software on multiple servers and platforms such as Windows, LINUX, AIX, Unix, and IBM z/OS. Setting up IQ Connexion is easy. You simply identify the connections to the data sources you need to access, write and save SQL requests that will extract the data you need, and reference the needed SQL request inside your query. When you submit the query, NGS-IQ automatically runs the IQ Connexion program, retrieves the requested data and loads it into a DB2 file on IBM i, processes the NGS-IQ query, and produces the requested output. IQ Connexion puts the extracted data into the QTEMP library so that it is only stored until the end of the session. If you want to retain the data, you can modify IQ Connexion to output the file to another library. Security is carefully maintained as the user profile running the query must have authority to run the IQ Connexion program, connect to the remote data source and database, and run the NGS-IQ query that uses the IQ Connexion program to extract the data. If you load the retrieved data into a library other than QTEMP, you can use NGS-IQ’s SeQure security management module to control access at the file, field and record level; identify who has authority to change, copy, delete, and/or run each query; specify who can e-mail or FTP the query output; and specify who can download the query output to a PC file. How is IQ Connexion Different from Qport Access’ Transfer To Host Function? IQ Connexion is one of two remote database transfer functions available to NGS-IQ customers. The other is the “Transfer to Host” function in the Qport Access module. The Qport Access Transfer to Host function lets authorized users create DB2 files from data stored in Microsoft Access tables. Using Microsoft Access as the middleware makes sense in many situations because it can import just about any file format, including Excel spreadsheets, CSV, TXT, and others, and it is already installed on millions of users’ PCs. Many customers use this function to upload price changes, budgets, mailing lists, customer credit data, and other modest datasets as needed. In contrast, IQ Connexion lets you retrieve remote data in real time whenever you run your query from IQ Server, Qport Builder, Qport Access, the RUNIQ command, or a job scheduling utility. The process is initiated and secured from IBM i and the remote data source, not the desktop. The transferred data can originate in SQL Server, MySQL, Oracle, DB2 on other platforms, and PostgreSQL databases. IQ Connexion and Transfer to Host give you two simple, secure and efficient ways to make critical data available for business intelligence and reporting. Can IQ Connexion Help Us Build a Data Warehouse? You may think of NGS-IQ as a query and business intelligence solution, but with the addition of IQ Connexion you can dramatically simplify cross-platform data integration and the maintenance of a DB2-based data warehouse on IBM i. If your company is looking into data warehousing, please take time to evaluate how NGS-IQ and IQ Connexion might ease your extraction, transformation, and load (ETL) tasks. Then consider how the NGS-IQ solution can help your end users, analysts, power users, and executives easily access that data warehouse and produce the reports, OLAP models, spreadsheets, and other types of output they need for strategic and operational planning. Does your company run software on multiple servers, operating systems, and databases? Do your managers and analysts ever need to pull together data on these different systems to produce reports, respond to auditors, or analyze business trends? Do you find yourself using different tools to access these different databases? Do your users complain the data is “stale” by the time it’s available to them in the format they want? Would you like to simplify and speed up the process while maintaining security and performance? 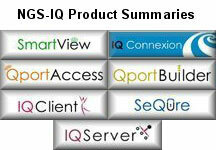 NGS-IQ and IQ Connexion are trademarks of New Generation Software, Inc. All other trademarks are the property of their respective owners. Please ask about our special IQ Connexion offer.